Key word: rehabilitation therapy for tubo-peritoneal infertility. One of the current issues of restorative medicine in gynecology is the development of new effective non-drug therapies for tuboperitoneal infertility (TPI) – most common, well-researched, but most treatment-resistant type of infertility in women (V.M.Strugatskiy et al., 2001; A.N.Razumov et al., 2002; L.V.Dubnitskaya et al., 2006). Rehabilitation treatment in early post-surgical period after tuboplasty is of high priority in solving this problem. Therefore alternative rehabilitation therapies need to be developed as the incidence of post-surgical complications is very high: recurrent adhesions, reocclusion and functional incompetence of fallopian tubes in 70-80% post-surgical patients (T.N.Revadenko, 1990, Yamada Y., 1990, M.A.Aliyev, 1998, G.A.Paladi, 1997, Carl M. Herbert, 2006 et.al). In the early postoperative period after laparoscopic operations for TPI, rehabilitation therapy must solve some problems such as providing analgetic and anti-inflammatory effects, intensifying microcirculation processes, preventing the development of adhesive process in the small pelvis, maintenance of fallopian tube patency, faster rehabilitation, reducing emotional stress (O.V.Yarustovskaya, 2009, and others). New pathogenetically substantiated methods that would simultaneously act on the driving mechanisms of pathogenesis, increase therapy effectiveness and result in less drug intake (A.N.Razumov, 2002-2008, T.E. Belousova, 2007 and others). On this basis, only that method which would improve the patient’s health as a whole can be considered effective (E.A.Turova, A.V.Golovach, 2005 and others). SCENAR-therapy is scientifically interesting and prospective treatment modality in early postsurgical period after tuboplasty, which combines the principles of physio- and reflexotherapy (A.N.Razumov, I.P Bobrovnitskiy, A.M.Vasilenko, 2009). Therefore, the objective of this research was to develop and provide scientific background for SCENAR-therapy in multiple rehabilitation treatment of patients after tuboplasty. Materials and methods. According to the objective and tasks set, 130 patients after laparoscopically assisted tuboplasty participated in the comprehensive clinical and laboratory examination and rehabilitation treatment. All the patients were of similar age (average age 28.4 + 1.7 years), with similar duration of the disease (in average 4.97 + 0.19 years), concomitant pathologies and clinical and functional data. Study groups included only women without any pathological changes in their endocrine profile. All the examined women were divided into 3 groups. Group I (control group) included 30 patients who received only drug therapy in early post-operative period after laparoscopic surgery for TPI. Group II (50 patients) – in early post-surgical period, starting from the 1st day, patients received drug therapy and electric pulse therapy with the SCENAR-1-NT device following the combined method that included external abdominosacral method (10-15 minute stimulation); local vaginal method (15 minute stimulation); stimulation of acupuncture points GI 11, E36, RP 6, 2 minutes each using the subjectively dosed mode with 90Hz frequency. Total stimulation time was 35-40 minutes, 10 daily sessions during the treatment course. Group III (50 patients) – patients who received drug therapy and electric pulse therapy with the SCENAR-1-NT device following the external method and stimulation of acupuncture points in early post-surgical period, starting from the 1st day. Stimulation settings and stimulation zones were the same as in group II. All patients underwent general clinical and laboratory examination, ultrasound investigation of the bloodflow in the uterine and ovarian arteries using the Doppler sonography; analysis of general antioxidant activity of the blood plasma and intensity of free radical oxidation processes; cardiointervalography to evaluate patient’s atonomic status; questionnaire survey to evaluate patient’s atonomic status, the questionnaire was developed by the Russian Center for Autonomic Pathology; analysis of patient’s psychological state using the questionnaire survey to calculate the index of general psychological wellness (by G. Dupuis, 1984, D.A. Rivitsky, 1996). 2-3 months after the rehabilitation treatment all the patients had hysterosalpingography with water solutions of contrast agents following the standard practice. Results and discussion. The research established that in all groups the major complaints were weakness, lack of energy, indisposition, headaches, increase in the axillary temperature up to 37.5 °C, cramps, intestinal dysfunction. After the treatment, a regression of clinical symptoms in the group I was observed no sooner than by 13th-14th day of the postoperative period, and was characterized by normal body temperature (p=0.01), decreased pain (p=0.004). In the group II that followed combined methods of SCENAR-therapy a regression of clinical symptoms was observed significantly (p=0.003; p=0.001 respectively) earlier – by 8th-9th day. In group III, where SCENAR was applied externally, the regression of clinical symptoms was observed by 10th-11th day (p=0.005; p=0.002 respectively). This is most likely due to SCENAR capability to produce anti-inflammatory and analgetic effects. An important aspect that provides the medical and economic significance is the reduction of in-hospital stay duration. For group I the duration of in-hospital stay of patients averaged 13.9 ± 1.92 days, for those who followed the combined method (group II) the results significantly differed from those of the group I, duration of in-hospital stay was 8.7 ± 0.26 days, and for patients who were treated with SCENAR externally (group III) – 9.6 ± 1.13 days. An important aspect that determines the clinical effectiveness of rehabilitation treatment is the fertility index that depends, particularly but not exclusively, on fallopian tube patency. 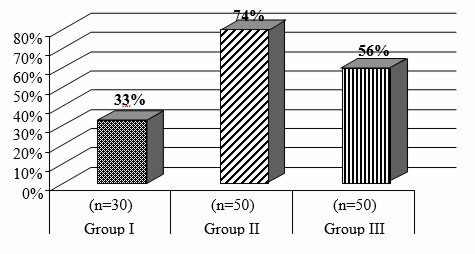 In group I, the percentage of tube patency preservation was 33% (10 patients), in group II – 74% (37 patients), in group III – 56% (28 patients) (see Fig.1). The results for maintenance of fallopian tube patency in groups II and III, are significantly better that those in group I (p=0.001, p=0.04). The assessment of treatment effectiveness as to such criterion as pregnancy occurrence showed that in group I this index was 23% (7 patients), in group II – 66% (33 patients), in group III – 46% (23 patients) (Fig.2). The treatment provided a significantly better effect in groups II and III than in the group I (p=0.001, p=0.04). What is more, in group II where the combined method was used, it produced higher indices for maintenance of fallopian tube patency (p=0.04) and occurrence of spontaneous pregnancy (p=0.03), as compared with group III. So, SCENAR-therapy in multiple drug therapy in early postsurgical period improves treatment effectiveness as a prophylaxis of reocclusion of uterine tubes and increases the generative function by 43%. SCENAR-therapy in multiple rehabilitation treatment of patients after tuboplasty contributes to improvement of regional hemodynamics, which is greater when following the combined method, that is proved by the 22% increase of resistance index in the uterine arteries and 23% increase of the resistance index in the ovarian arteries. SCENAR-therapy in treating patients after tuboplasty neutralizes negative changes in the state of lipid peroxidation system and antioxidant system, greatly decreases lipid peroxidation and increases antioxidant activity. At this the correction of lipid peroxidation and antioxidant system indices is significantly more often observed when following the combined method. SCENAR-therapy in early postsurgical period after tuboplasty decreases the stress of body regulatory mechanisms, decreases the influence of sympathetic and increases the tone of parasympathetic systems, which is indicative of increased stability of autonomic regulation. SCENAR provides evident psychocorrective effect, manifested as decrease of anxiety level, depression, increase of self-control, general health and emotional well-being. SCENAR-therapy in multiple rehabilitation treatment of patients in early postsurgical period after tuboplasty helps the patients to overcome the postsurgical period easier, decreases the intensity of pain syndrome, and promotes reduction of the in-hospital period. Combined method is by 32% more effective than the external one. Summarizing all the above, we should emphasize that SCENAR-therapy is an effective treatment modality for rehabilitation of patients after tuboplasty in early postsurgical period. The analysis of literature data and obtained results gives reason to believe that SCENAR-therapy action is provided by its beneficial effect on regional circulation. The improvement of regional hemodynamics, in turn, decreases the intensity of inflammations in the organs that are reflex-related to the area treated, and blocks pain receptors. The other effects are improved trophic functions of pelvic organs, which improves functional activity of fallopian tubes, prevents adhesions, and promotes higher percentage of preserved tube patency and occurrence of spontaneous pregnancy in the long-term period. A significantly better effect provided by combined method of SCENAR-therapy is most likely due to the mechanism of therapeutic action of vaginal physical treatment that, according to A.N.Obrosov (1965) and S.V.Vdovin (1980) are based on reflex response realized neurohumorally, and in J. Huberta’s (1985) opinion – the groups of vaginal acupuncture points make trigger zones that unite primary acupuncture channels – specifically, the stomach, spleen-pancrease and conception vessel meridians that can restore the reproductive function. The developed rehabilitation therapy that includes SCENAR-therapy as a component of multiple treatment in the early postoperative period after tuboplasty can be recommended for practice in the system of medical and prophylactic institutions.